In this project, these guest artists turn the typical protective nature of an umbrella inside out, investigating an umbrella as a container rather than a shield. The artists will create a number of umbrellas harboring their dreams inside, and ask the general public to contribute their dreams – each one that is chosen will receive a custom-made umbrella in return, as well as have their concepts posted on the RMB City blog. 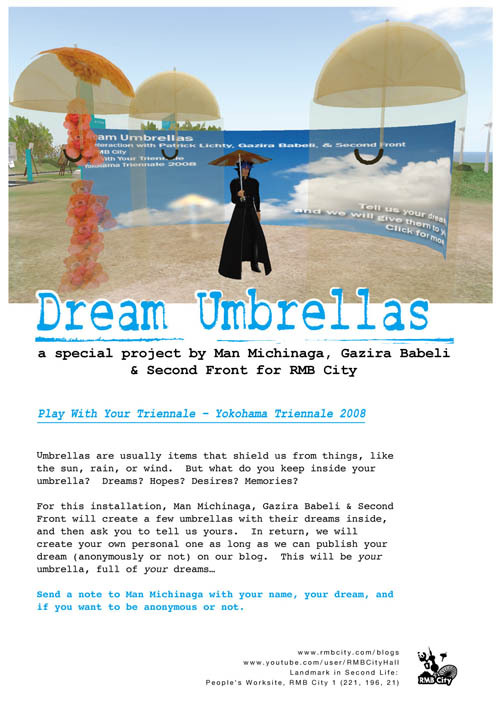 To participate, simply visit the People’s Worksite in RMB City to test out the demo umbrellas, then send a note of your personal dreams – with your name or anonymously – to Man Michinaga. Selected participants will be given a personal umbrella with their dreams inside, and all dreams will be published on the RMB City blog (please withhold your name if you wish it to be anonymous). Patrick Lichty is a New Media artist of over 18 years, Co-Founder of the virtual performance art group Second Front, and animator for the activist group, The Yes Men. He is also a Professor of Interactive Media Arts & Design at Columbia College, Chicago. Gazira Babeli is an artist and member for Second Front who lives and works in the virtual world of Second Life, where she was born on 31 March 2006. Like all inhabitants of virtual worlds, she is an identity construction known as an avatar, but unlike them, she does not acknowledge the presence of a “human” controlling her.